Intensive studies have been done to a wide range of natural and synthetic polymeric scaffolds which have been done for the use of implantable and temporal devices in tissue engineering. Biodegradable and biocompatible scaffolds having a highly open porous structure with compatible mechanical strength are needed to provide an optimal microenvironment for cell proliferation, migration, differentiation, and guidance for cellular in growth at host tissue. One of the most abundantly available biopolymer chitins and its deacetylated derivatives is chitosan which is non-toxic and biodegradable. It has potential biomedical applications such as tissue engineering scaffolds, wound dressings, separation membranes, antibacterial coatings, stent coatings, and biosensors. 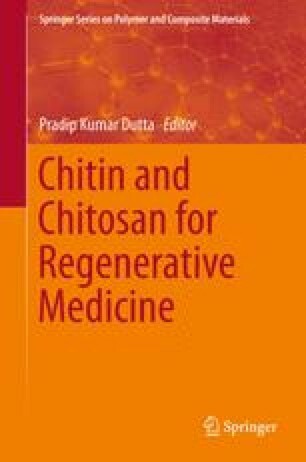 Recent literature shows the use of chitin and chitosan in electrospinning to produce scaffolds with improved cytocompatibility, which could mimic the native extra-cellular matrix (ECM). Similarly, silk from the Bombyx mori silkworm, a protein-based natural fiber, having superior machinability, biocompatibility, biodegradation, and bioresorbability, has evolved as an important candidate for biomedical porous material. This chapter focuses on recent advancements made in chitin, chitosan, and silk fibroin-based electrospun nanofibrous scaffolds, emphasizing on tissue engineering for regenerative medicine. One of the authors (PKD) thankfully acknowledged the financial support from CSIR New Delhi in the form of a research project and other author (BKS) gratefully acknowledged the financial support in the form of research associateship from CSIR New Delhi.